"Are you a good manager?" This game defies the player to make decisions at each level of the process of youth project management. The character is a nice funny mannikin that has to overcome difficulties and challenges at each stage. The game consists of 6 phases with 3 questions. 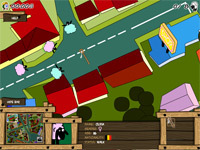 The player has to solve various problems in order to move forward. In the end of the game the youngster will receive an assessment of their achievement and management skills. :: To tolerate improve leadership and management skills. In this game, the player is a pilot of a space craft. His task is to bring back to Earth the information about the project �Map of the Black Substance in the Universe�, which has been stolen from extraterrestrials. The pilot should gather as much pieces of information as possible in each of the 4 Levels of the games. At the end of each level, he should decide which pieces of the obtained information to keep for the purposes of successful completion of the mission. Eliminate as many aliens as possible in order to get higher score and finally, get back all information about the stolen project. This game tests player�s knowledge on key issues related to project management. Questions are focused on practical aspects in the process of managing youth projects � some detail about needs analysis, target groups, methodology. Drag the answers to their right places. The player can proceed to the next question only if the previous one is solved properly. :: To improve the management skills of the player. Description: In this game you are the shepherd who has to guide 8 sheep through the town and take them to the train station. However, this is not an easy task. Each sheep represents a youngster (a boy or a girl) that has different interests and it is not easy task to look after all of them. You have to take in mind their individualities and prevent them from dangerous situations like street fight, smoking. You will see how difficult is to manage and guide young people with different interests, how challenging and responsible is the work of the youth worker and youth leader. Description: This is a simulation game where the player has to develop a youth center. He�s got a certain amount of money, employees and events to organize. The player has to manage the center well so that it can progress. Playing the game you can learn more about how to manage projects.